The carver of this masterfully executed bowl achieved a remarkable sense of movement within the carved effigy atop its rim. The round bowl, with rounded bottom is hewn thin and the crowning Manitou effigy is dynamic and almost animate in nature, its arms, or wings, outstretched, drawing the viewer into the belly of the bowl. The head of the effigy has a curious, partially carved point in its center and may represent the being’s eye or was used as a directional device. 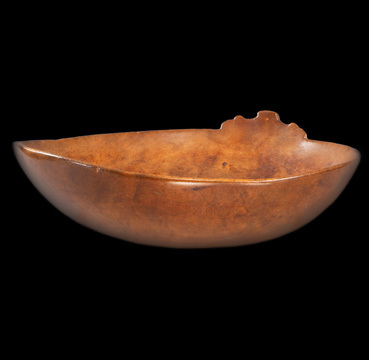 The bowl displays a silky smooth surface with complex patination and coloration.